174 Power Global Corp., a subsidiary of South Korea’s Hanwha Energy, held its groundbreaking last week for the largest solar power project in Texas: a 236-MW plant to be built in Pecos County. It will sell its power – enough to power more than 50,000 homes – to Austin Energy, Austin’s municipally owned power provider. NRG’s Buckthorn Solar Farm, 200 MW in Pecos County, to supply the City of Georgetown, the largest municipality in the country powered solely by renewable sources. The Roserock Solar Farm in Pecos County, 156 MW, built by Southern Power and Recurrent Energy, under a 20-year power purchase agreement to supply electricity to Austin Energy. 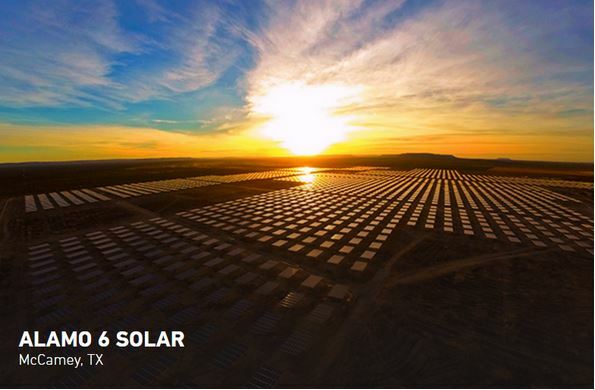 The 120-MW East Pecos Solar Facility, by Southern Power, also to supply power to Austin Energy. Alamo 6 Solar Farm in Pecos County, 110 MW, part of a 450-MW solar farm network designed to provide power to the greater San Antonio area. The Castle Gap Solar Farm in Upton County, covering 800 acres and using 485,000 photovoltaic solar modules to provide 116 MW, by SunEdison. Costs of solar cells have declined significantly, making solar power more affordable. Power storage remains the principal obstacle to greater reliance on renewable sources. West Texas is, of course, also in the middle of a resurgence in oil and gas development. Sun and oil overlap. But horizontal drilling technology has made it easier for solar farms and drilling to coexist. Solar farms can set aside areas for pad sites for horizontal wells that traverse up to two sections. So West Texas is taking advantage of its two biggest resources – the desert blooms.